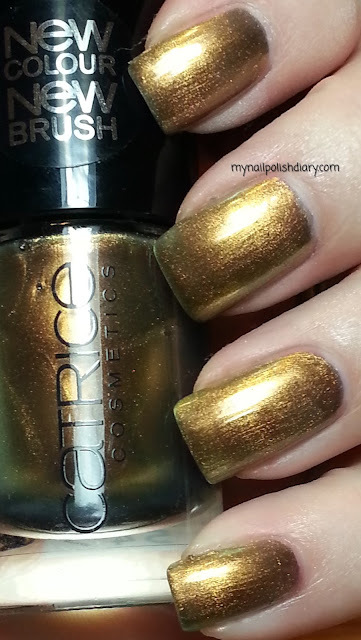 Genius In A Bottle by Catrice is a metallic gold duochrome. It flashes gold, green, and bronze. It's close to Chanel Peridot but not an exact dupe. For me, it's close enough. I'm not in love with this color enough to want the Chanel version with it's $25 price tag. I really don't love this color at all. I thought I would. I made a swap with a nice girl from Ireland to get it. I did my nails as soon as I got it I was so anxious to see it on. For me, it bubbled, streaked and just didn't melt my butter. I know lots of girls are crazy mad over this type of color. It's just not for me. Maybe I'll trade it with someone one day. What do you think? Do you like this type of color? I love this color! And, I'm glad there are lots of dupes to choose from.